SPOTCHEM EZ performs biochemical measurements easily with the dry method and solid phase reagent. A built-in compact centrifuge reduces pretreatment of samples before measurement. 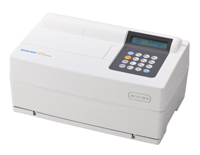 SPOTCHEM EZ is a most-advanced dry chemistry analyzer. Management by barcode is available.